While walking with crutches, peak loads observed in the wrist and palm can approach 50% of body weight and the wrist can experience extreme hyperextension. The repetitive, high loads and poor wrist postures associated with crutch use have been shown to lead to joint pain and injury, carpal tunnel syndrome, arthritis, or joint deformity. To address these issues, we are developing a light weight, pneumatically-powered forearm orthosis to improve wrist posture and reduce loads in the wrist and palm while using Lofstrand, or forearm, crutches. Lofstrand crutches tend to be used by people that need long-term gait assistance. We designed a pneumatic sleeve that is attached to the forearm cuff of the crutch. The user inserts the forearm into the sleeve, which can be actuated to constrict about the forearm. Thus, some of the body weight load would be redirected to the cuff of the crutch via the sleeve, instead of the entire load going into the crutch handle via the wrist and palm. The constriction force is created by pressurizing a custom-fabricated McKibben pneumatic muscle actuator that was wrapped around rigid splints attached to the crutch cuff. This custom McKibben muscle is one embodiment of a Fiber Reinforced Elastomeric Enclosure (FREE) actuator. FREE actuators can be constructed to produce a variety of motion patterns (constriction, expansion, rotation, and coiling). To produce a self-contained system to pressurize the sleeve, we are developing a method to harvest pneumatic energy from the crutch during walking. The goal is to use a custom piston pump in the crutch tip and store pressurized air into an elastomeric accumulator housed in the crutch shaft. The pump is also expected to operate as a shock absorber to mitigate impulse loading on the body. The instructor is showing the technique to the students. Spasticity is an abnormal muscle hypertonia behavior, affecting more than 12 million people respectively worldwide and usually associated with the brain lesion caused by spinal cord injuries, strokes, cerebral palsy, etc. The presence of these abnormal muscle behaviors will cause involuntary movements that hinder daily activities and affect the quality of life. The current assessment method for spasticity that relies on qualitative scales, such as the Modified Ashworth Scale (MAS), generally has poor inter-rater reliability rising from its subjective nature. It is crucial for students training for healthcare professions that evaluate patients with spasticity to have a clear understanding of different levels of spasticity and to gain sufficient hands-on assessment experiences. Current methods are inconsistent due to variability in training and limited availability of practice patients. Therefore, there is a clear need to develop a spasticity training simulator that can provide realistic and consistent replication of spasticity at different levels to minimize the need for practice patients. Passive hydraulic training simulators for biceps spasticity. (a) First-generation. (b) Second-generation. The goal of this study was to develop a passive upper extremity simulator that can consistently replicate biceps spasticity in the elbow at different levels and be used to train future clinicians. Two generations of the simulator prototype have been developed. The first-generation prototype was capable of replicating most aspects of spasticity at MAS levels 0-4 and the second-generation added more design features to replicate subtle clinical signs of spasticity, such as variable catch angle, reduction in ROM, etc. A clinical evaluation study with a group of experienced clinicians will be conducted to validate the performance/realism of the second-generation training simulator. Liang, J, Ewoldt, RH, Tippett, SR, and Hsiao-Wecksler, ET, 2016, “Design and Modelling of a Passive Hydraulic Device for Muscle Spasticity Simulation”, ASME. J. Med. Devices, 10(2), pp. 2016020954-020954-2. Pei, Y, Liang, J, Ewoldt, RH, Tippett, SR, and Hsiao-Wecksler, ET, 2017, “Validation of a Passive Hydraulic Simulator for Spasticity Replication”, ASB Midwest Regional Meeting, Grand Rapids, MI, Feb 23-24. 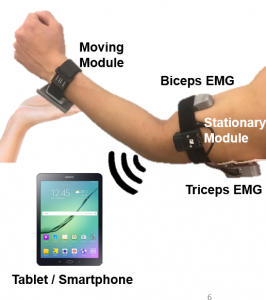 We are developing a wearable and ergonomic device (PVRM) to quantify passive arm movement of people with abnormalmuscle behavior. A clinician would attach the PVRM on the patient’s arm and perform a manually move the patient’s arm while recording the arm movement data. This project involves a diverse interdisciplinary team of engineers from Human Dynamics and Control Lab, industrial designers from the art and design department, physical therapy students/faculty from Bradley University, and clinicians from Illinois Neurological Institute. The term “soft robotic” refers to a powered device that uses compliant materials for actuation. Powered exoskeletons developed for the upper extremities are primarily large, heavy, and rigid. There has been limited research into the development of truly lightweight and compliant exoskeletons which are not dominated by a rigid frame. Prof. Girish Krishnan, of the Monolithic Systems Lab, has developed a new class of soft pneumatic actuators called fiber-reinforced elastomeric enclosures (FREEs). FREEs can extend, contract, twist, stiffen, or bend when pressurized, depending on their specific fiber orientation. Their ability to create complex motion and on-demand rigidity make them ideal components for use in a soft robotic orthosis. The goal of this project is to take advantage of the unique mechanical behavior of FREEs, as well as the compliance which is the defining characteristic of soft pneumatic actuators, to create an assistive exoskeleton for the upper extremities. Our primary focus will be the design of a hardware test platform using novel architectures of FREE actuators, with consideration given to control schematics following hardware validation. This platform will provide a basis for upper extremity actuation using FREEs. The project will include three phases: (1) Biomechanical assessment of the upper extremities to establish design requirements for the exoskeleton, (2) Assessment of FREE hardware and development of novel FREE architectures to establish performance capabilities of the FREE actuators, and (3) Development of the exoskeleton using the design requirements and performance capabilities established in Phases 1 and 2, along with preliminary testing of the device. Modern humans display a wide range of variation in body size and shape. While all humans practice bipedalism in essentially the same way, it is unclear how these vast differences in body size affect locomotor performance and activity. This project will evaluate the functional consequences of body size in humans through a lab-based biomechanics study of 80 short and tall male and female subjects and a bone microstructure analysis of 30 femora and tali. Previous studies of scaling patterns in mammals suggest that size-related differences will be present in three major areas: 1) specific locomotor events during walking and running gait, 2) general changes throughout the gait cycle or activity, and 3) trabecular and subchondral bone properties. 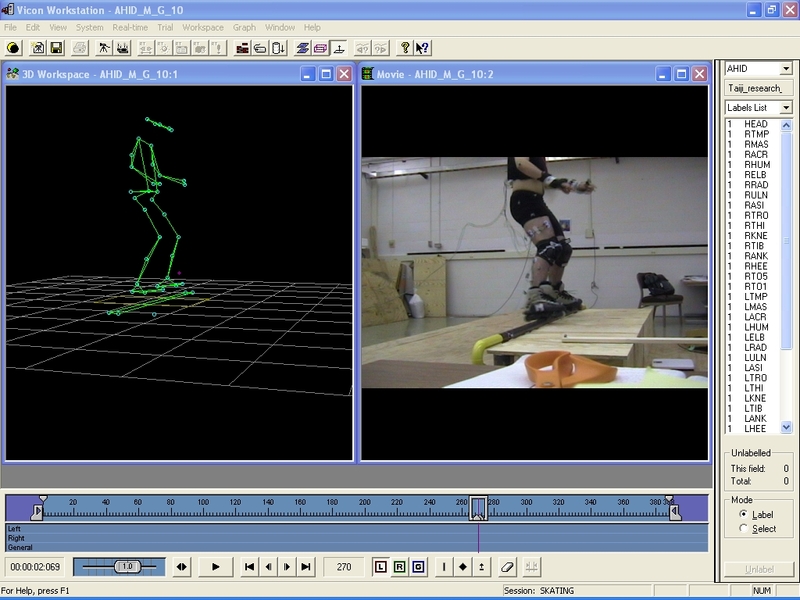 Data from standing, walking, and running trials will be collected from a 6-camera Qualisys 3D motion capture system and force plates (AMTI, Bertec instrumented treadmill). These kinematic and kinetic data are used to evaluate posture and limb flexion, relative force production, and leg spring stiffness at specific points during gait. They may also be used to assess stride length and frequency, angular excursion, and balance throughout walking/running and standing trials. Analyses of bone microstructure will reveal patterns of habitual loading and posture. These data indicate whether small and large individuals employ different mechanisms to remain upright and locomote bipedally through the world, as well as whether they have implications for the activity and behavior practiced by our hominin ancestors. Approximately 3.26 million Americans are wheelchair bound and an estimated 83% of this population are manual wheelchair users (MWUs). MWUs exhibit a high incidence of self-reported shoulder pain that increases with duration of wheelchair use and is attributed to excessive mechanical loading of the glenohumeral (shoulder) joint during wheelchair locomotion. Various modified wheelchair systems have been developed to ease upper extremity work during wheelchair locomotion including powered, push-assisted, lever-driven, and geared wheelchairs. In collaboration with IntelliWheels, Inc. and the University of Wisconsin-Milwaukee, we are designing an instrumented wheelchair hand rim that may be used with both geared and non-geared wheelchair wheels. This device measures the forces and torques at the point of application of the hand on the hand rim as well as wheel kinematics throughout locomotion. This information could provide new insight into the As the first instrumented hand rim for geared wheelchair wheels, this device could validate our hypothesis that gearing manual wheelchair wheels provides users a nonintrusive method to prevent overuse induced injuries in the upper extremities. Parkinson’s disease (PD) has been estimated to affect 5 million people worldwide, 1 million in the United States alone. Two of the most devastating symptoms of PD, estimated to affect up to 50% of the population, include freezing of gait (FOG) and start hesitation. This simply means that a person with these symptoms has difficulty with successfully taking the first step. 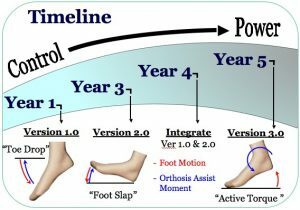 It has been recently demonstrated that these symptoms arise from an inability to properly coordinate a set of anticipatory postural adjustments (APAs) for gait initiation. Forms of external cueing such as auditory (music, rhythmic beeping), visual (objects, lines on the floor), and somatosensory (vibrating insoles) cues have been show to help elicit more normative APAs in persons with PD; however, the forces generated are under scaled in magnitude. 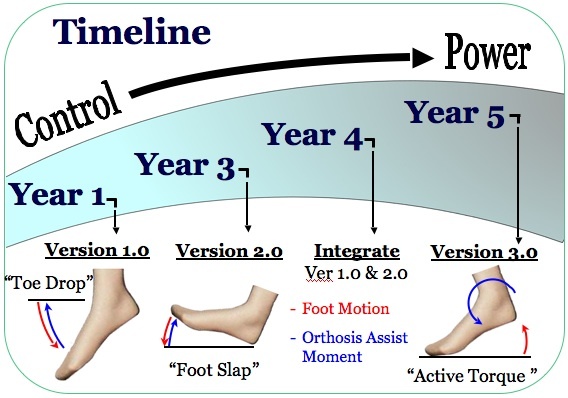 In this study, we are investigating the utility of our portable powered ankle-foot orthosis (PPAFO) to provide active assistance at the ankle during gait initiation. 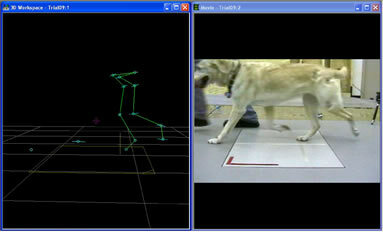 Currently we are developing control strategies that more reliably elicit the necessary APAs for gait initiation. The ultimate goal of this project is to increase independence for people with PD who suffer from FOG and start hesitation by providing a dependable daily wear device to alleviate these symptoms. Acute lower limb injury may lead to chronic gait problems or even disability due to asymmetry between the injured and uninjured limb. Current clinical gait analysis techniques used for diagnosis and rehabilitation are qualitative in nature and do not quantitatively assess recovery. The overall goal of this project is to develop quantitative techniques to assist in the treatment and monitoring of lower limb injury and asymmetry. Gait is a dynamic behavior with considerable changes in joint and body positions throughout the gait cycle. 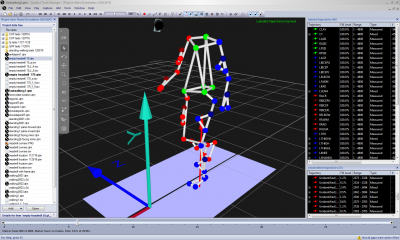 We are developing a novel technique, Integrated Multivariate Motion Analysis (IMMA), to distinguish asymmetry in gait and identify the source of asymmetry. IMMA uses geometric shape analysis (Generalized Procrustes Analysis) with multivariate statistical techniques (Principal Components Analysis and Parallel Factor Analysis) to capture the dynamic nature of walking behavior that current univariate measures cannot capture. This is a collaborative project with faculty in the Departments of Kinesiology & Community Health, Psychology, and Anthropology. As first responders to emergency situations, firefighters play a crucial role in homeland security. Therefore, providing support to these first responders by examining human factors issues to improve their health and safety is of critical national importance. Falls and loss of balance on the fireground are one of the leading causes of traumatic injuries among firefighters, resulting in ~11K injuries per year (i.e., over 1/4 of all annual fireground injuries). Many of these events are potentially preventable; however, research examining the underlying mechanisms leading to these events and efforts to develop intervention programs to prevent falls have been limited. 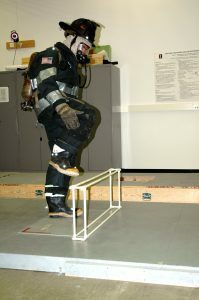 Along with the Illinois Fire Service Institute (IFSI) at UIUC, we are developing a research program to explore how firefighting equipment and environment affect balance, locomotion, and slip, trip, or fall (STF) risk. The overarching goal of this program will be to improve firefighter safety by reducing preventable STFs and provide knowledge that will aid in the choice and design of better firefighting gear. Specifically, we are examining how the addition of personal protective equipment (PPE), which consists of coat, pants, gloves, boots, helmet, hood, and self contained breathing apparatus (SCBA), affects STF risk through modification of gait and balance performance. Investigating how individuals respond to disturbances to balance is essential to improving our understanding of the etiology of falls. Balance and postural control mechanisms during perturbed stance may change with age. These differences may manifest themselves in the behavioral characteristics of the postural response noted immediately after a perturbation. We are particularly interested in the response of the postural control system after a transient perturbation. Limited work has been done to explore postural responses to sudden, impulse-like perturbations. In this investigation, the impulse loading and impulse response control-theory paradigm will be used to examine the postural response to a mild, quick-release backward tug. While impulse response and its associated characteristics are rudimentary concepts in engineering control theory, we have only just begun to extend this paradigm to investigate postural control. The purpose of this study is to learn more about how to characterize responses to a transient perturbation, what these responses tell us about the postural control system in general, and how these responses may vary with age. Much of the research related to falls in older adults has used retrospective self-reports of falls over the previous 6 months or year. We are developing a prospective slips, trips, and falls survey (STAF Inventory) to better establish the incident rate of falls and fall-related behaviors. This survey evaluates the number of fall-related incidents as well as the environmental conditions, individual factors, and whether any injuries have occurred over a given study period.. Falls and fall-related events are being tracked for a period of 30 days. The STAF inventory is being administered to college-aged, middle-aged, and older adults. This is a collaborative project with faculty in the Departments of Kinesiology & Community Health, and Psychology. Cranial cruciate ligament (CCL) rupture is one of the most common injuries to the canine hind knee and is the leading cause of degenerative changes in that joint. Stress injuries are believed to result from a combination of conformation characteristics within the entire limb, resulting in a biomechanical imbalance between forces acting on the cranial tibial thrust. However, the exact role of each of these factors and their significance in relationship with CCL deficiency has not been defined. The objective of the current study is to examine whether there are distinct differences in the kinematics and kinetics of gait in healthy and injured Labrador Retrievers. To perform the gait analysis, we are collecting motion data which will be augmented with segment parameter data derived from CT and radiographic images of each animal’s limb. Our long-term goal is to develop a mathematical model integrating a combination of morphometric parameters to estimate the risk of developing CCL deficiency in each dog. This is a collaborative project with the College of Veterinary Medicine at the U of I.
Tai Chi has been promoted to older adults as an exercise to improve physical and mental fitness. It has also been found to reduce the likelihood of falling in senior citizens. This project explored how Tai Chi experience may modify postural control mechanisms and movement strategies specifically during unexpected external perturbations to balance and while walking over level ground and obstacles. We are also investigating new techniques for assessing Tai Chi skill proficiency. We conducted both cross-sectional studies on individuals with long-term Tai Chi experience (> 2 yrs) and longitudinal studies on older adults who received Tai Chi training for 5 months. This is a collaborative project with faculty in the Departments of Kinesiology & Community Health, and Psychology. Inverse dynamics is a powerful tool for the biomechanical analysis of human movement, and is commonly used to calculate the net torques generated in various limb joints. Despite the widespread use of this method, past research has shown that the errors in joint torque calculations are relatively large. These errors are attributed to inaccuracies in the input variables of the inverse dynamics equations. We have determined that the primary contributor is inaccuracy in the measured motion (e.g., segment angle profiles), and the secondary contributors include inaccuracies in estimations of body segment parameters (i.e., mass, center of mass location, moment of inertia). To improve the accuracy of inverse dynamics estimations, it is necessary to find techniques to reduce the effects of these error sources. We propose the development of an optimization-based approach that can accommodate errors due to both measured motion and body segment parameters. The development of the optimization-based approach will include several studies. The proposed approach has the potential to change the way joint torque estimations are made, and will lead to better clinical and research tools for the analysis of human movement. Aggressive in-line skating is a sport that emphasizes balance. A popular activity is grinding, where the skater jumps onto a grind rail — which may be a specially designed structure at a skatepark, or a common handrail on a staircase. In grinding, skaters jump up and accurately place their skates on the rail, smoothly decelerate, and balance upon the rail while sliding (or “riding it out”). In-line skaters have developed a heuristic approach to training. Inherent to their training are exercises that emphasize the development of muscle control during eccentric, muscle stretching, contractions to smoothly decelerate the body. For example, before performing a grind, the skater would repeatedly jump upon an object and “stall” — that is, jump, place skates on the rail, decelerate, and hold that position. In this novel study, we collected data on limb motion and forces developed during deceleration activities, such as grinding and stalling. By performing controlled jumping and balancing experiments, this project allowed us to gain insight into how these individuals are able to use eccentric contraction to assist with maintaining balance and, perhaps, minimizing impact force and energy. Pregnant women ancedotally state that balance changes as pregnancy progresses and the circumference of the trunk and body weight increase. However, no studies have examined how balance, and postural control that moderates balance, may vary throughout pregnancy and the subsequent postpartum period. This study assessed how balance and postural control varied as a consequence of pregnancy by examining how a subject’s postural sway varied over the 9 month pregnancy and a following 6 month postpartum period.